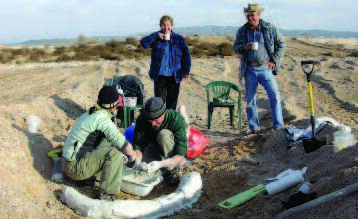 Elaine and Earl Gowin look on while UGS paleontologist Don DeBlieux and his wife Jane jacket a mammoth tusk discovered in a gravel pit on the Gowin’s farm near Fillmore, Utah. Fossils like this tusk are common in the shoreline gravels of Lake Bonneville, an Ice Age lake that covered much of western Utah. The addition of significant new localities like this to our paleontological locality database adds to our understanding of prehistoric life in Utah. Paleontological resources are managed mainly for their scientific value, but also for their educational and recreational values. In this context, Utah’s fossils are among the state’s unique and valuable natural resources. Different types of fossils require different resource-management strategies. So how are these resources managed, and who is responsible for their management? • Fossils on federal land are a part of America’s heritage. • Most vertebrate fossils are rare. • Some invertebrate and plant fossils are rare. • Penalties for fossil theft should be strengthened. • Effective stewardship requires accurate information. • Federal fossil collections should be preserved and available for research and public education. • Federal fossil management should emphasize opportunities for public involvement. The UGS is not a land-management agency. However, Utah State Code, which provides legal authority to the UGS, establishes the state’s “interest in the preservation and protection of the state’s paleontological resources and a right to the knowledge derived and gained from the scientific study of these resources.” Utah State Code also assigns authority to the UGS to “collect and distribute information regarding the …paleontology… of the state; … stimulate research, study and activities in the field of paleontology; … mark, protect, and preserve critical paleontological sites;” and “collect, maintain, and preserve data and information in order to accomplish the purposes of this section and act as a repository of information concerning the geology of this state.” The UGS is also charged with the authority to issue permits for qualified paleontologists to excavate critical paleontological resources from state lands. In other words, the UGS is charged with the responsibility for the preservation and protection of Utah’s paleontological resources from state lands, and has a mandate to collect information about fossils. Effective data management is another key to successful management of paleontological resources; to this end the UGS Paleontology Section maintains a paleontological locality database for the state of Utah. This database includes 9,699 localities from all lands in Utah. Our authority to compile and maintain locality data is derived from partnerships and cooperative agreements with state and federal land-management agencies. In particular, the UGS has had a cooperative agreement since 2002 with the Utah State Office of the Bureau of Land Management (BLM) for the management of paleontological resource data for BLM lands within the state. The BLM manages 23 million acres of land in Utah (42% of the state’s land area), the largest area of any single land-management agency in the state. Under our agreement with the BLM, the main focus of work has been to convert existing paleontological locality data into a format that can be used in a Geographic Information System (GIS). To protect critical fossil resources from vandalism and unauthorized collecting, information in the locality database is released only to land managers and qualified paleontologists engaged in paleontological mitigation and research. The only specific locality data released to the general public are for those sites that are open to public visitation. For example, information about the St. George Dinosaur Tracksite can be found on our website where there is a locality map for visitors as well as a summary of the ongoing paleontological research. We also have, or have had, various cooperative agreements for specific paleontological resource-management projects with many agencies, including Zion National Park, the Bureau of Reclamation, and the U.S. Forest Service at Flaming Gorge National Monument, and Grand Staircase-Escalante National Monument. These projects involve using our locality database and GIS analysis to produce paleontological sensitivity maps and address specific research and management issues.